The National Conversation (Raw): Am I a geek? As a child, I used to run home from school to watch every episode. On long family vacations, this is the car I drove in my mind's eye as we lumbered across the flat boring plains of Illinois. Before Spider Man, before the famous Millennium Falcon and X-Wing star fighter, before Star Trek and the USS Enterprise (well almost), there was the powerful Mach 5! I love Speed Racer! I am a Speed Racer geek! There I said it. Now you know, and on May 9, 2008, I know where I will be -- watching the film version of the T.V. show, Speed Racer: Demon on Wheels! The brothers Wachowski, who produced V for Vendetta and the Matrix trilogy, are returning to the big screen to bring back Speed and the family (Pops, Spritle, Chim Chim and Trixie). If Racer X and his car Morning Star are in the movie, I.. will… die. Why should Boomers have all the fun? Gen X had its cultural icons, too! Update: The picture of the Mach 5 is not a toy model, it the real deal!!! While I loved Spider Man, Star Wars, and Star Trek, I have to admit never understanding the appeal of Speed Racer. Ultraman, on the other hand was da man! Boy, do I miss Ultraman. Christina Ricci was an actor in the sitcom The Adams Family. Remember? 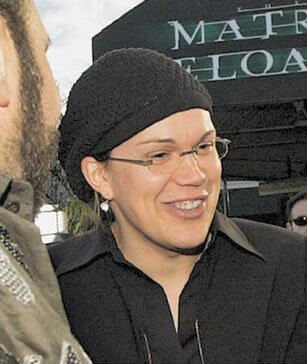 FYI, Wachowski's aren't brothers anymore, they're brother and sister. Larry=Lana. Uhhhhhhhhh. I think I knew that but chose to forget it. Watch. I'll forget it again... Oh rats, you showed me the picture. While I wasn't a big fan of the cartoon...I'll definitely watch a Wachowski treatment...should be interesting! In this 1% instance yes you are a geek, though I find in 99% of other instances you are not. Thanks for the link, that brings back so many happy memories. I loved that show when I was a kid. Yup. . You definitely are a geek! Maybe Bernard will see the movie with you! Is there going to be scenes of Emil Hirsch frozen, in front of a seizure inducing backdrop going, "Haaaaaaaaaaaaaaa?" I would also like to see the parents of the boy go clothes shopping. I want to see the face of a woman who dresses her child the same as the family ape.